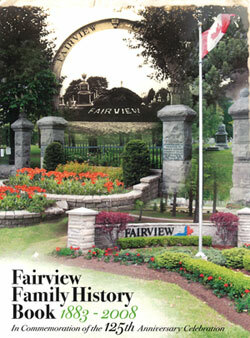 The Fairview Family History Book in commemoration of the 125th anniversary celebration of Fairview Cemetery - First and Second Edition - is made possible by a number of "authors" who worked tirelessly and lovingly to put their research and memories to paper in stories that tell of people who immigrated from far off countries, toiled the land, made fortunes and lost them during the Great Depression, served in the World Wars, held political office, was a loving father, mother, grandfather and grandmother..... Each author has their own unique way of presenting their story - some more factual, others through compelling narrative, providing insight into the way of life (and death) during the past 125 years. It was a joy to read them and an even greater pleasure to pass them on, through this commemorative book, for others to enjoy. Derek McDermott - he was always available to fix the format and the photos that never seemed to fit for me as well as provide encouragement, a story and a laugh behind the scenes. Check out a couple of Derek’s own stories! Gail Woodruff - a busy lady who took time to edit and provide fine details in the First Edition. Gail is the author of stories well worth the read! Andrew Porteus - a valued Library historian who provided good advice on book layout and indexing. Andrew did a great job on indexing the Second Edition! Sherman Zavitz - our City Historian who provided many stories in the first section of this book from his weekly columns in the Review. Dan Carson - a talented graphic artist who provided the cover to this book. The response to the call for submissions for the 125th anniversary commemorative book was outstanding. The list grows as others learn of the project and want to tell their story in a possible upcoming edition. To be a part of future editions, please send your information to fairview@niagarafalls.ca. For additional information or to purchase a copy of The Family History Book, please contact Niagara Falls Cemetery Offices at Fairview Cemetery at 905-354-4721.